Xbox and the entire “Killer Instinct” team at Microsoft Studios and Iron Galaxy announced that the Legend of Thunder costume is available, free, to all “Killer Instinct” players. The Legend of Thunder costume is 100 percent authentic to the Nez Percé warrior tradition – from the new metal axes to the buckskin & beaded pants. You must own the Thunder base character to access the costume – it’s the first time they’ve had a third costume for our characters, and it’s a special one. 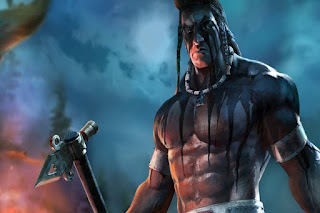 When they rebooted “Killer Instinct” in 2013 for the launch of the Xbox One, they knew Thunder needed to be more culturally representative, and the Nez Percés were partners in making that happen. However, the rush of launching a game during a console release, plus the pressure of maintaining a nostalgic look that KI fans remembered, meant they weren’t able to get everything right. Now, with three seasons under thei belts and a community of fans that embraces the game for the chances that were taken, they knew it was time to make things right. It was time to take care of the Nez Percé community that took care of the creators. The Legend of Thunder is a small way of saying “thank you” for not only inspiring artistically, but for letting them borrow and portray the vibrant Nez Percé culture. For additional details about the collaboration with the Nez Percé in creating the Legend of Thunder, please check out Xbox Wire.